From small residential developments to large commercial buildings and industrial complexes, survey provides the foundation for planning, design, and overall project success. To facilitate timely response to your needs and expedite turnaround time, we have an extensive survey staff located throughout the Midwest. By coordinating with project teams, we assist contractors, design professionals, and other stakeholders to complete projects quickly and efficiently. Our goal is to exceed requirements, rather than meet them in order to provide long-term solutions. With a focus on client satisfaction, we excel at meeting challenging schedule demands, even if the needs change once we arrive. State-of-the-art technology, training, continued research, and development empowers us to provide accurate, detailed data and surface models. We understand the importance of doing it right the first time and work diligently to stay at the forefront of the industry using Trimble, Leica GPS, and Leica remote control total stations. Along with hardware, we use special software created for GIS data collection, road alignment staking, precise level runs, and topographic survey work. Gathering evidence is key in reestablishing existing property lines. Property line locations are based on monumentation, record descriptions, and physical evidence. Working closely with owners, developers, attorneys, title companies, and governmental offices ensures the right evidence is collected, resulting in an accurate location of original property lines. Prepared according to standards set by the American Land Title Association (ALTA) and the National Society of Professional Surveyors (NSPS), we provide ALTA Surveys for the issuing of title or mortgage insurance. 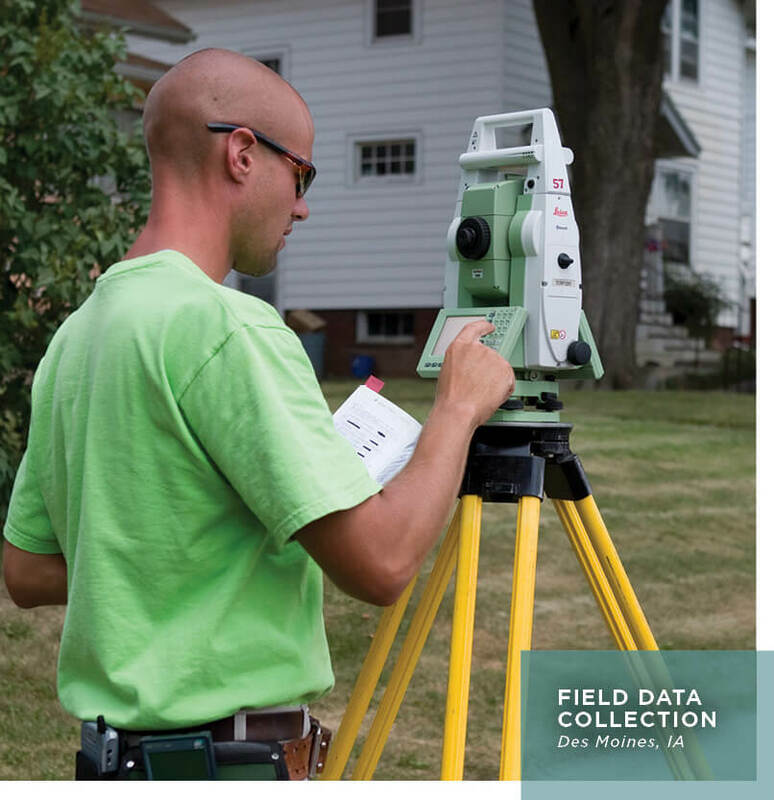 These highly detailed surveys include property boundaries and all structures such as fencing, buildings, and easements, in order to verify compliance with current zoning regulations. Following individual State’s processes and delivering surveys in their native format allows owners to use survey data as if their own staff had performed the survey work themselves. It’s our intention to deliver high-quality services as if we are an extension of your staff. Using current and emerging technology, we provide detailed, accurate surface models for projects ranging from simple to complex. With an emphasis on maximizing the benefits for all stakeholders, we can create new and define existing easements for public and private utilities and access. Keen attention to detail is given to verify plan sets against digital/electronic files prior to construction staking in order to foster horizontal and vertical accuracy. Mission planning for photogrammetry is key to a successful flight. We understand the need for accurate ground control targets and photo-identifiable points for top-notch results. Using terrestrial scanners, we can develop an accurate point cloud to a density that is appropriate to the project. This method allows us to capture details of exterior buildings, bridges, industrial/commercial interiors, etc., that would take weeks to collect using traditional survey methods. This level of detail is perfect for building additions, bridge inspection, and remodels. Verifying constructed improvements in relation to the design plans is an important step in the construction process. We pride ourselves in working with all parties involved to deliver critical, relevant information in a format that allows the end user to understand what was actually constructed. Providing a known horizontal and vertical control for your city, county, or institution is essential to be able to talk the same language from project to project and year to year. We have established control networks for sites as small as 10 acres and as large as communities over 50,000 residents. Flood mapping is unique and sometimes difficult for business owners and residential property owners to understand how it impacts them. We can assist with this challenge and how it relates to your site. Once this is identified, we will provide guidance on the rules and regulations affecting your site and if necessary, provide solutions for compliance. 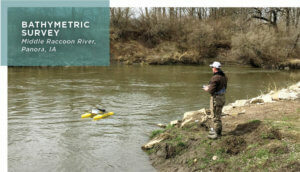 Utilizing a sonar system mounted on our flat-bottom boat or remote control hydrone, bathymetric survey is performed to map the underwater ground surface of rivers, lakes, and ponds.